Last night, we tried a recipe for twice-baked potatoes and we loved them. I don't know how it is at your house but we always make too many potatoes, especially at this time of year when people are watching their carb intake! It happened again this past weekend when we had six potatoes left after a family get-together/birthday party. My husband who really hates wasting food asked if we couldn't do something with all those potatoes because he was just tired of throwing them away. 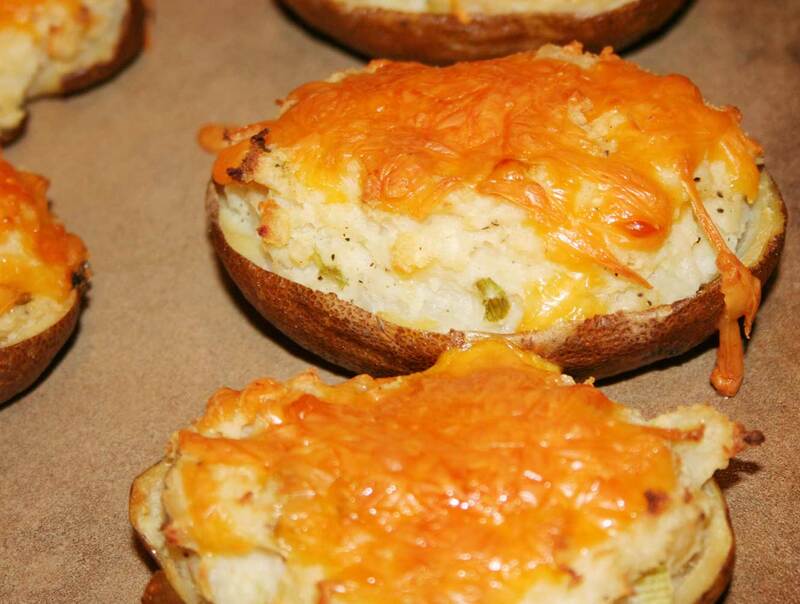 He asked if we could make some of those "mashed-up-and-put-back-together potatoes." It only took me a minute to realize he was asking for a twice-baked potato recipe. I told him I would find a recipe but couldn't guarantee I would have time to make them and he said he would be SO happy to make them, especially if it meant we didn't have to throw away any more potatoes. This is what he did: For 6 small already baked potatoes, he split them in half lengthwise and scooped out the potato centers leaving a thin layer of white potato inside each potato half . The insides of each potato was placed in a bowl. To this he added 6 tablespoons of buttermilk and 3 green onions, finely chopped. Salt and pepper was added, to taste (about 1/2 teaspoon salt and a pinch of pepper). He grated 4 ounces of cheddar cheese and set it aside. The potato, buttermilk, onion, salt and pepper were all mashed and blended together. (The cold potato will remain a little lumpy.) The mixture needs to be relatively smooth. 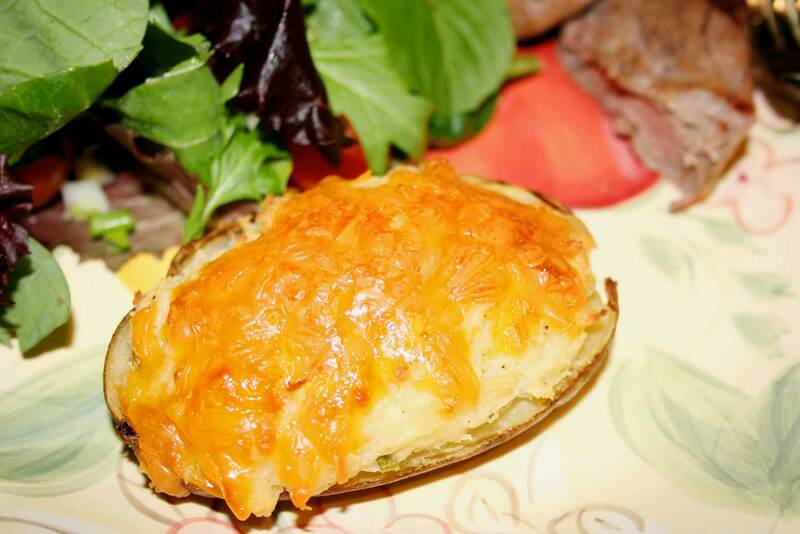 He spooned the mixture into each potato skin and topped each potato half with lowfat cheddar cheese. The potatoes were baked at 375 degrees until the cheese was melted and browned and the potatoes are toasty, about twenty minutes. Our potatoes were baked on a stone cooking sheet. We sure did enjoy them and to make it an even better night, we warmed up leftovers. These potatoes made it seem like a fresh, new meal and they are the light version!